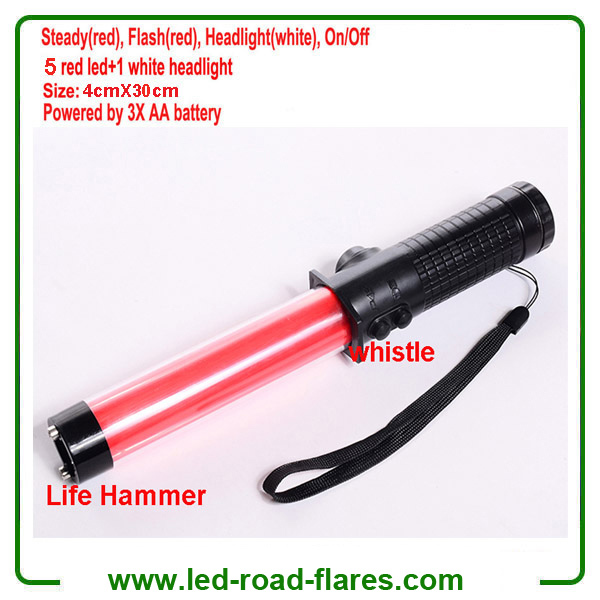 Led Traffic Wands With Lifehammer and Whistle is used to Increase visibility and manage traffic situations and great for an emergency responder specifically for use by Law Enforcement, Fire, Rescue and EMS/Ambulance,Roadway,Railway,Civil aviation, Police equipment,Hotel Parking. The 12" Led Traffic Batons With Siren and Window Breaker provide highly visible traffic safety light for guidance and alert to pedestrians or drivers. The Traffic Batons feature a handy top light (white headlight) and a magnetic base. Led traffic batons are waterproof, shock resistant and with 6 super bright Led lights, a magnet on bottom, siren, window breaker, flashlight on the end and handle strap. The 12" LED Traffic Baton is the latest in traffic directing safety, serving as both a safety baton and flashlight. 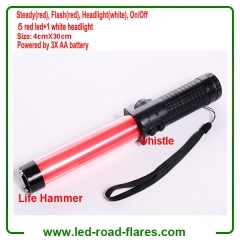 This LedTraffic Baton features a durable ABS casing, polycarbonate lens.The Non-recharegable LED Traffic Baton is battery operated (requires 3pcs AAA Alkaline batteries, not included) and has three operating modes. Super bright LEDs make it high flashing and alarming effect at night. A lanyard at end make it easily handle . Flashlight /Window Breaker/Siren Function is available.